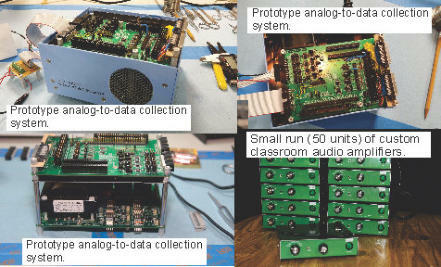 We do small custom electronics projects. We can take your project from concept to design to prototype to small production runs. Small means small in size or in number of items. If you are looking for thousands of an item we can help you find someone - but we specialize in small projects. We are moving into our new facility at 833 E. Sprague St, Winston-Salem, just off I-40 and US-52 near the Piedmont Triad Research Park. We hope to be open for new business in late 2015. Call us for appointment or inquiries.